My soul hurt when I walked along the magnificent Amazon River in Peru and saw the shores littered with bottles, bags and other trash. I turned to my husband and said "How can this be? This is THE Amazon River..." My cousin, an elementary teacher in the Amazons, responded with "People just don't care..."
Why don't people care? That's something I wondered for a long time. As a child, I vividly remember watching a video segment on saving ocean wildlife. I remember seeing ducks covered in oil, fish caught in plastic bags and a beautiful turtle stuck in a 6-pack plastic ring, which they said would have never happened if the ring would have been cut into small pieces and recycled. Those images have stayed with me and 25 years later I'm still cutting up the 6-pack plastic rings into tiny pieces before recycling them. "Watershed Adventures of a Water Bottle" by Jennifer Chambers is a wonderful children's book which follows the life of a water bottle named "Scout" that was dropped into the street, goes down the drains and into the ocean. Scout encounters many animals and insects along the creeks and rivers of Washington DC. All the animals share their stories with Scout about how their lives are affected by the trash that pollutes their homes. Not only are Scout's adventures into Chesapeake Bay entertaining but it is also very educational and eye opening to children. The Watershed Heros, Alima and her mother, are great examples that I could show my children of how we could help the environment. What did my toddlers love about this book? Illustrations ~ My toddlers loved the illustrations by Jesse Auth. Very life-like and creatively simple, all the animals were a big hit in this household especially the turtle! The Ocean ~ It is very close to their hearts! My children absolutely love rivers, creeks, lakes, ponds and especially the ocean. Reading about an adventure on any waterway is always fun for my children! Conflict-Resolution ~ I've noticed that around the age of two my toddlers are able to understand the concept of conflict-resolution and don't like it when their favorite characters, in this case the Scout and the animals, are in trouble. My daughter said "It's scary" when the turtle was choking on the bag but I was able to continue reading about how Scout helped the turtle, which was a great teaching opportunity. Educational ~ This book is not just a story but educational to children AND adults! There were a few terms that I was not familiar within the story, but thankfully there is a Glossary of Terms in the back of the book. I also knew that plastic could be recycled but for some reason I never really understood that plastic never goes away. Now I know! Resourceful ~ There is a list of organizations and websites such as the Chesapeake Bay Trust, Surfrider Foundation, Ocean Conservancy and many more environmental non-profit organizations that can provide more information on how to help. Chambers also has a list of "10 Tips to Reduce the Use of Disposable Plastics". Worthy Cause ~ 100% of the profits of "Watershed Adventures of a Water Bottle" goes to support the Chesapeake Bay Trust and the Surfrider Foundation Rise Above Plastics program. How great is that! Readable for all ages ~ The reading comprehension might be a little above toddler level but I was able to quickly summarize the story appropriate for my toddlers. It will be a book that will grow with my children. Clean Up! Any time you leave your house and see trash/plastics/cans on the street, pick it up. It would be great if we could all volunteer for a coastal clean up once or twice a year but taking little steps every day like picking up a bottle on the street will stop stories like "Scout" from ever happening. I highly recommend finding an regional organization to do a coastal/riverside cleanup in your area. Also, being a hiking family we always have our eyes open for trash on the trail that could be picked up! In this case, a Mylar balloon was on a hillside that could have easily been washed away in the creeks. That's my little boy hiking up the hill to get the balloon, clean up time isn't just for toys at home! Use Reusable Bags ~ I'm very proud that my county has enacted a ban on plastic grocery bags. It might take getting used to taking your own bags to the grocery store but it really does make a difference! My city looks cleaner already and knowing that there are less and less bags in the environment makes me happy! Going back to my original question, I believe people do not care because they do not see the consequences of their actions. One water bottle might not seem like a lot but thousands of them end up on the shores, create "plastic islands" in the ocean and end up hurting wildlife in and out of the ocean. One of the many responsibilities of being parents is teaching our future generations to take care of our "Sachamama" or Mother Earth which includes our waterways. Watershed Adventures of a Water Bottle is a great book to ignite the love of taking care of our Earth in our children. Everything is interconnected from San Francisco Bay to the Chesapeake Bay to the Amazon River in South America, let's work together to make our watersheds cleaner! What will you do to help your near by watershed? Jennifer Chambers blog and website: Hiking Along and "Watershed Adventures of a Water Bottle"
Jennifer Chambers generously provided this book for the purposes of a review. As always these are my true and honest opinions. Jennifer Chambers is a middle school Science teacher, environmental educator, author of two books, outdoor blogger and owner of Hiking Along LLC. Her nature playscape is Washington DC where she loves to hike with her two kids. Oooh Look at that Book! On a boring evening probably about a year after I got married, my husband and I were roaming around Barnes & Nobles in Fremont (which doesn't exist any more) looking at our favorite section - Travel. 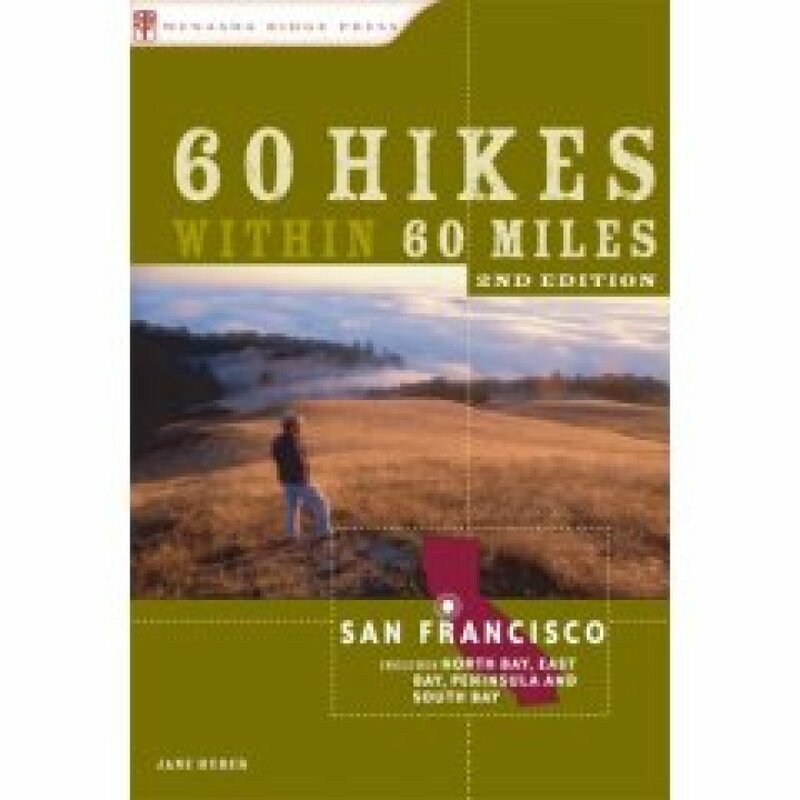 We were probably preparing for our Peru 2007 trip but a certain book caught our eye, "60 Hikes within 60 Miles, San Francisco," by Jane Huber. I think they produce these types of books for every metropolitan area, like Los Angeles, Seattle, etc. The book describes 60 detailed hikes in the North Bay, East Bay, Peninsula and South Bay. It also describes hiking recommendations for hikes good for kids, runners, hikes featuring waterfalls, etc. So far we have only hiked six of the 60 featured hikes in this book. Only 54 hikes to go! I hope this weekend we can do hike no. 5 listed in the book, Jack London State Historic Park. We are going to a friends wedding in Sebastopol, so why not hike before?